 <31-Jul-02>: IrfanView version 3.75 is now available from the download page at www.irfanview.com. This an easy-to-use free graphics converter for working with your MSTS screenshots - resize, save as JPEG files, brighten, or add other effects. Seen at the Train-Sim.com file library: Gavin Mclaughlan's NSW freight wagons: nody.zip (28-Jul-02, 682kb) and nkhy.zip (30-Jul-02, 1.2Mb), a light fix for the NALW Genesis locos gen_ltfx.zip (30-Jul-02, 565kb), improved sounds for the NALW Genesis locos with a working "chug" sound gen_chug.zip (29-Jul-02, 90kb).  <29-Jul-02>: Route Riter is now at version 3.3. Although it's a very handy tool for route developers to enable them to pack their routes for more efficiently for us to download, it also does a great job of reducing disk space for routes we've downloaded and installed. Route Riter saves disk space by getting rid of those files in a downloaded route that are already part of the default MSTS routes. 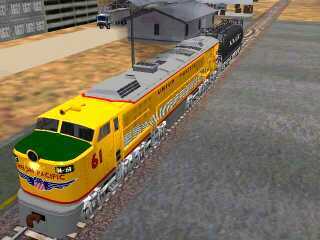 You'll find the download in rriter33.zip (3.6Mb, 24-Jul-02 at the Train-Sim.com file library.  <28-Jul-02> webTrainSim has found a couple of problems with the Virgin Class 390 Pendolino, namely the MaxPower value is double what it should be and the horn is not heard, neither in the cab or externally. The latter problem is too complicated to solve in a couple of lines so expect a page explaining what to do. The MaxPower value is easily fixed by loading each ENGine file, 390dms.eng and 390dmfk.eng, into WordPad and changing the 5100kW value in each to 2550kw.  <27-Jul-02>: At the Train-Sim.com file library: updated Acela Express locos #2009 & #2020 aclahsel.zip (29-May-02, 2.6Mb) and passenger cars with more realistic, shiny bodywork: business class coach acelaca2.zip (18-Jul-02, 1.9Mb), business class end coach aclaendb.zip (22-Jul-02, 808kb), first class coach aclafrst.zip (645kb, 24-Jul-02); Joseph Realmuto's modern track sounds: 200m between joins, as for realworld welded track, sounds change at 50-60mph, and sounds under/over bridges are more in tune with your train's speed: modtrkv2.zip (26kb, 24-Jul-02).  <25-Jul-02>: Seen at the Train-Sim.com file library: UP Turbine yellow tender bbv2mod.zip (22-Jul-02, 201kb), some fixes to Big Boy (water swapping in the boilder, braking, slipperyness) bbbugfix.zip (15kb, 22-Jul-02), and another more realistic Acela car with shiny skin aclaendb.zip (808kb, 22-Jul-02). 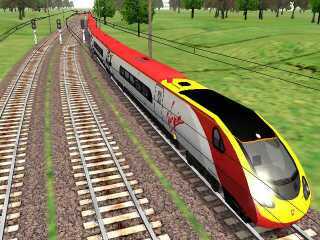 Virgin Class 390 140mph Pendolino.  <23-Jul-02>: A page has been added to enable you to tune the ENGine files of both the CityRail V-Set and Tangara trainsets for more realistic behaviour; webTrainsim is not completely happy and will be looking for more improvements. webTrainSim has downloaded the Virgin Class 390 Pendolino trainset virgincl390.exe (16-Jun-02, 2.1Mb) from UK Trainsim, more to look at and drive what Australian rail could have for high-speed passenger services - alas, no Federal Government support for Australian rail, no improvement in service. By the way, you need to time your access to UK Trainsim. A "new day" starts at 2000 UTC and there's a download limit of 1.8Gb which is soon reached by users. BNSF Z-PTLCHC22 meets Amtrak Train 7, the westward bound Empire Builder, at Bison West.  <22-Jul-02>: Z-PTLCHC22 continues its trip across Marias Pass 3 (ptlchc22.zip activity from the Train-Sim.com file library). Don't be in a rush - re-starting at Java or just west of Summit is not for the faint-hearted.  <21-Jul-02>: There's a page added to give you some parameters to bring more prototypical behaviour and performance to the N.S.W. CountryLink XPT trainset. All the details to tune-up the XPT are here. For those of you into route development, or thinking about undertaking the task, webTrainSim suggests you consider these tools from the Train-Sim.com file library: Shape Shifter ss_beta1.zip (13-Jul-02, 1.8Mb) and the MSTS file info display app mstsgde1.zip (4.1Mb, 17-Jul-02). For those of us on dialup connections, two reasonably-sized routes are the Modern City Tramway route mct.zip (5Mb, 18-Jul-02) and the ATSF Raton Pass route atsfrp1.zip (8.2Mb, 19-Jul-02; a second file download will be available soon). UP "Big Blow" gas turbine loco with black tender.  <19-Jul-02>: webTrainSim is working away at updating the ENGine file for the XPT trainset. The idea is to set values for two power cars, one of which will have head-end-power (HEP).  <18-Jul-02>: You might inform MSTS fans on their next trip across Marias Pass that 100 years ago the Glacier National Park had 150 glaciers. Now it contains only 40. webTrainSim is doing some tuning to the NSW V-Set and Tangara train sets - details soon. Just seen in the Train-Sim.com file library: UP turbine locos, version 2, with new sounds, cabview and improved textures bblowup2.zip (9.9Mb, 17-Jul-02), brake and sound fixes for the UP Big Boy bbmod11.zip (16kb, 17-Jul-02) and Series 30000 railcar s3000b2.zip (16-Jul-02, 2.6Mb).  <16-Jul-02>: webTrainSim is busy with the Z-PTLCHC2 activity. He's probably going to use ActivityChanger to change the start time to early morning so he can do some sightseeing along the way. As well, he'll probably put NALW's UP Dash-9 on the front (with the help of ConBuilder) so he's got the in-cab signals (then track monitor can be turned off but occasionally used to check speed limits and distances to signals).  <15-Jul-02>: Seen in the Train-Sim.com file library: a freight activity for Marias Pass 3 (getting intermodal Z-PTLCHC2 from Whitefish to Shelby), ptlchc22.zip (32kb, 13-Jul-02), NSW NGMF mill wheat wagons ngmf.zip (1.5Mb, 14-Jul-02) by Gavin Mclaughlan, and an interesting tool for route developers, Shape Shifter ss_beta1.zip (1.8Mb, 13-Jul-02).  <13-Jul-02>: Just seen in the Train-Sim.com file library: NSW City Rail Tangara T set by Ben Shields, tangara.sip (1.1Mb, 12-Jul-02) and a complete collection of JPEG images which depict all .S shape files in MSTS (4 files, mstspix1-4.zip, each about 4Mb, 12-Jul-02). To completely fix the Big Boy whistle problem, not only do you need bbwhist.zip (124kb, 07-Jul-02), you also need bigboy_patch.exe (47kb, 04-Jul-02) from the NALW site.  <12-Jul-02>: Young Kurt Kaminer has released several add-ons and they're available from the Train-Sim.com file library: EMD F59PH locos klwf59.zip (4.2Mb, 08-Jul-02), EMD 40 series loco sounds klw40snd.zip (1.4Mb, 17-Jun-02), and EMD 12-567 series engine sounds (for F7s, F9s, GP7s and GP9s) klw7snd.zip (1.07Mb, 10-Jul-02). Kurt's website is at www.klwtrainsim.cjb.net. There's been some more background info added in regard to the Amtrak Empire Builder timetable. Using an article from the May 2002 edition of Trains magazine, webTrainSim is also learning, at last, some valuable geography. He now knows how the Cascade Range (east of Seattle) causes such dry weather to the east, including the BNSF Montana Hi Line across Marias Pass. Big Boy #4005 simmers in the Fort Fairfax yard.  <11-Jul-02>: At last! Union Pacific Big Boy #4005 is now part of the webTrainSim roundhouse. Its addition might motivate the yardmaster to learn how to drive a steam loco! A reminder that #4005 needs some small improvements - see yesterday's and the day before line news.  <10-Jul-02>: There are some more small fixes for the Big Boy: smokefix.zip (207kb, 08-Jul-02) and firefix.zip (266kb, 08-Jul-02). Also noticed in the Train-Sim.com file library: two EMD F59PH locos in Canadian GO Transit livery, klwf59.zip (4.2Mb, 08-Jul-02), and a fix for the VR 1910's 27AW carriage, 27awup.zip (342kb, 08-Jul-02). And, the webTrainSim roundhouse still hasn't got the UP Big Boy! The file library continues to be very busy! ConBuilder, the handiest tool for MSTS, is now at version 1.5. You can download it from Carlos' site at www.geocities.com/conbuilder/.  <09-Jul-02>: A writeup is now available that details updated engine parameters for the NSW 8203 loco. A sample ENGine file for the class 82 can be viewed by clicking here (opens in a new window). webTrainSim hasn't yet been able to add the UP Big Boy to the roundhouse - perhaps today is the day. By the way, there are a couple of extra files to download: a missing sound file, bbcruis5.zip (73kb, 06-Jul-02) and an updated whistle, bbwhist.zip (124kb, 07-Jul-02). For a bit of fun, try Chris Longhurst's Jet Test Vehicle, ctjv1.zip (4.5Mb, 06-Jul-02), which has a Trent 800 jet engine - it's available at the Train-Sim.com file library.  <08-Jul-02>: Mountain grade operation: Air Brake and Train Handling Rules for mountain grade operation apply on mountain grade between Summit MP 1151.0 and Java East MP 1165.2. Eastward trains must not exceed 11,500 tons. Ruling grade descending westward is 1.8. Heavy grade descending eastward between MP 1146.0 and MP 1141.0 (Bison) is 1.2. The maximum number of powered axles in head end consist ascending mountain grades must not exceed 36. Before descending grade, westward, Summit to Java West, MP 1151 to MP 1165, it must be known that locomotive consist(s) has the minimum number of operative axles of dynamic brake.  <07-Jul-02>: Search webTrainSim now available (on the left).  <06-Jul-02>: A writeup is now available that details updated engine parameters for the NSW class 81 locos. A sample ENGine file for the 8120 can be viewed by clicking here (opens in a new window).  <05-Jul-02>: UP Big Boy by NALW is now available in bigboyv1.zip (04-Jul-02, 13.7Mb) at the Train-Sim.com file library. Good luck trying to log in to download it! Be patient, like webTrainSim, and wait a day or two... Note you can browse the New Files section without logging on - there'a a link at the bottom of the login page or simply click here.  <04-Jul-02*>: The rush is on! NALW have released their UP class 4000 Big Boy 4-8-8-4 articulated steam loco and it should be soon available at the Train-Sim.com file library - probably July 5th Aussie time. If you're not sure why there's a big fuss, take a look at the history of the Big Boys at the Union Pacific site. "Put a little warm water in 'em and they'll go", was the favourite saying of Big Boy firemen of the time. Well, it was more like 12,000 gallons of water and 11 tons of coal per hour to drive these 6,300 hp locos, capable of 80 mph top speed. NSW 8120 & 8203 were teleported to Marias Pass for testing. Here they're easing into Summit after the long climb. I-2 traffic is in the background.  <04-Jul-02>: Recently ConBuilder teleported NSW 8120 and 8203 to Marias Pass for testing. Both locos have had their motors tweaked for more realistic performance with changes to friction, air brake and dynamic brake parameters. The locos led a consist of 8 carriages and 12 car carriers, the load being approximately 1450 tonnes in weight and 600 metres in length. Apart from some wheelslip at Java West, probably due to the lighter weight of Australian locos compared to U.S. ones, the test was considered successful. Tests are now being undertaken with NR82 and NR53 who both have had their motors and performance tweaked to NALW C40-8W specifications. To allow for electrical current decay and to prevent a surge of dynamic braking, pause for 10 seconds before changing from power to dynamic braking. Reduce the dynamic braking level before the train reaches the crossing. 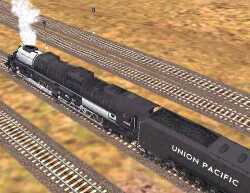 Wait until the entire locomotive consist passes over the crossing before increasing the dynamic braking level. Reduce the brake handle position and dynamic brake retardation until the light goes out. If the light does not go out, stop the train and inspect the locomotive. Do not supplement the dynamic brake with the locomotive brakes unless in the process of starting or stopping and speed is below the effective range of the dynamic brakes in your locomotive consist. The locomotive brake should never be relied on to control speed in lieu of an effective dynamic brake. Extended range dynamic brakes must be utilized to their fullest extent.